KUALA LUMPUR (Dec 3): The FBM tumbled 27.82 points or 1.56% to close at its intraday low of 1,758.15 on foreign selling amid concerns over the weakening ringgit. Analysts said the KLCI was also weighed down by weak corporate earnings announcements during the just-concluded financial reporting season here. The KLCI's decline today erased yesterday’s 7.7 point gain. Yesterday's gain followed a 42.62 points or 2.34% slump on Monday. 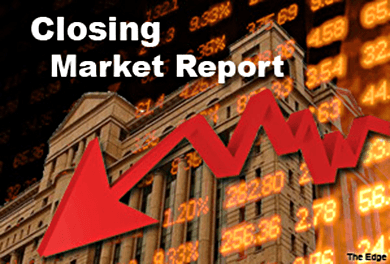 Today, the KLCI plunged on losses in counters like Hong Leong Financial Group Bhd and RHB Capital Bhd. “Foreign investors are worried that the Malaysian ringgit will continue to weaken against the greenback and that might be the reason that triggered the selldown in the local equity market,” UOB Kay Hian Malaysia Head of Research Vincent Khoo told theedgemarkets.com. The ringgit weakened to 3.4435 versus a strengthening US dollar. The US dollar strengthened on a more positive outlook on the US economy, drawing fund flows back to US dollar-denominated assets. Reuters reported that while economists fear the sharp drop in global energy prices could magnify deflationary forces in some countries, both New York Fed President William Dudley and Vice Chair Stanley Fischer this week painted a mostly rosy outlook for the U.S. economy and had welcomed cheaper oil. Brent crude oil was traded at US$71.10 a barrel at the time of writing. In Malaysia, Bursa Malaysia saw 692 decliners versus 179 gainers while 247 counters remained unchanged. Volume was 1.47 billion shares valued at RM1.79 billion. Top gainers included Dutch Lady Milk Industries Bhd, Petronas Dagangan Bhd and Huat Lai Resources Bhd. Top decliners included British American (M) Tobacco Bhd, PPB Group Bhd and BLD Plantation Bhd. The most active counters included Perisai Petroleum Teknologi Bhd and Minetech Resources Bhd. In Asia, Japan's Nikkei 225 gained 0.32%, while China's Shanghai Composite advanced 0.58%. Reuters reported that the dollar marked a fresh seven-year high against the yen on Wednesday, which helped lift the Nikkei to a similar closing record, while oil prices recovered on news of a drop in U.S. supply.